Bitcoin climbed suddenly on Tuesday to the highest level since November, leading a surge in virtual currencies and ending three months of calm in the US$160 billion market. Traders struggled to pinpoint a reason for the rally, which briefly lifted Bitcoin above US$5,000 and increased the value of digital assets tracked by CoinMarketCap.com by about US$17 billion in less than an hour. The biggest virtual currency was trading at US$4,686.68 as of 7:43 a.m. in London, up 14 per cent for the day, according to Bloomberg composite pricing. 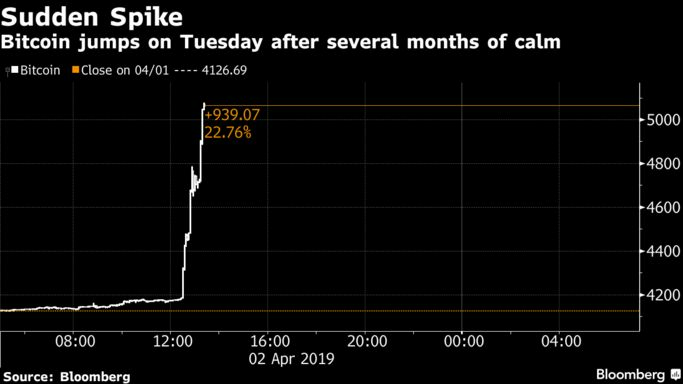 Rival coins Ether, Ripple and Litecoin also jumped, as did cryptocurrency-linked stocks in Asia including Remixpoint Inc. and Monex Group Inc. While sudden swings in Bitcoin are nothing new, price action in the virtual currency has been relatively subdued this year as investors weighed the prospects for more mainstream adoption after last year’s 74 per cent crash. Market participants say big buy or sell orders in Bitcoin can often lead to outsized moves, in part because volume is spread across dozens of venues. Trend-following individual investors can also exacerbate volatility. George Harrap, chief executive officer at Bitspark, a cryptocurrency firm, said he’s putting “most things on pause” until the market settles down. He said his contacts in the Bitcoin community have yet to come up with a catalyst for the sudden jump.